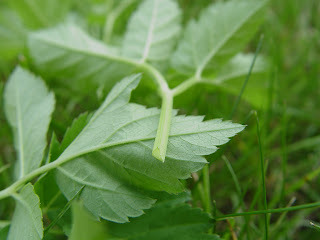 Ground-elder (Aegopodium podagraria) is a perennial of the carrot family (Apiaceae) that grows in the shade. Perhaps I should say thrives in the shade, or invades the shade (or semi-shade or sun) areas of your garden. It goes by several other names including herb gerard, bishop’s weed, goutweed and snow in the mountain. Ground-elder is not closely related to elder (sambucus), but they do have somewhat similar leaves and flowers. Confusion often arises when it is misspelled as two words: ground elder. It is always hyphenated. Ground-elder can make a beautiful lush cover in difficult shady spots. There is also a variegated variety that you can purchase at certain garden centres. If you want any, I'll give it to you. It flowers in umbrels composed of small white flowers not unlike Queen Anne’s Lace, which is in the same family. Ground-elder leaves grow to about 12” high. The flower set somewhat higher than the leaves. Ground-elder can also be the most pernicious of the weeds. Once you have it established in your garden good luck trying to get rid of it. We had some sneak in under the neighbours fence several years ago. We were not vigilant and now it’s even coming up in the lawn. Ground-elder grows in North America, Britain, and Europe through to West Asia. In times past it has been an important food source in most of these regions. Its earlier popularity is easy to understand. It grows prolifically (to say the least) and you can begin to harvest early in the year when almost nothing else is available. There are still good recipes to be found and it is often still eaten in parts of Scandinavia, Russia and Lithuania. Britain was introduced to ground elder by the Romans, who planted it as their legions marched. It grows so rampantly that they could be guaranteed a food source quickly. has this stem profile according to Wikipedia. The best leaves to pick are the young “shiny” ones. You can note the difference when you see the plant. After flowering apparently the plant takes on a bitter taste. You can stop flowering by pinching, this will ensure the plant remains edible if used more sparingly as a pot herb. 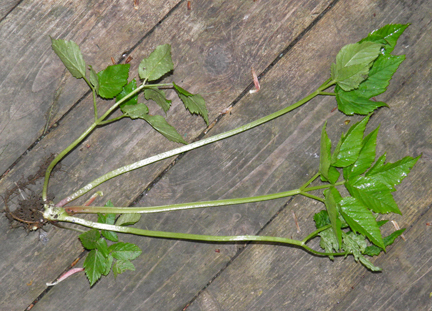 The stems of Ground-elder are triangular when cut (see photo). According to Wikipedia there is no toxic lookalike plant to ground-elder that has this triangular profile. 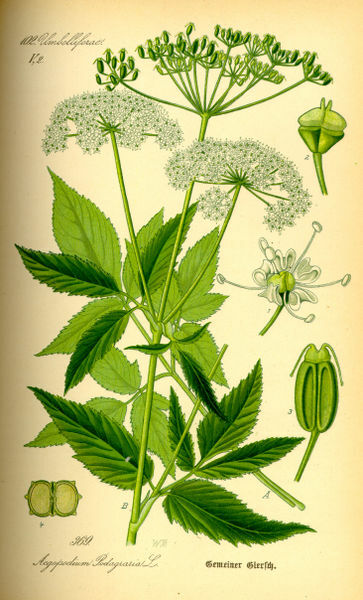 Ground Elder has a long history of medicinal use and was cultivated as a food crop and medicinal herb in the Middle Ages. The plant was used mainly as a food that could counteract gout, one of the effects of the rich foods eaten by monks, bishops etc at this time. The plant is little used in modern herbalism. All parts of the plant are antirheumatic, diuretic, sedative and vulnerary. An infusion is used in the treatment of rheumatism, arthritis and disorders of the bladder and intestines. Externally, it is used as a poultice on burns, stings, wounds, painful joints etc. The plant is harvested when it is in flower in late spring to mid-summer and can be used fresh or be dried for later use. A homeopathic remedy is made from the flowering plant. It is used in the treatment of arthritis and rheumatism. The European Food Safety Authority examined claims about the benefits of ground-elder in maintaining or achieving a healthy body weight in 2009. Unfortunately they were not able at that time to verify the claims because of their inability to discover a cause and effect reference for the claim. But they do in their roundabout scientific way list Aegopodium as a food source. I sacrificed one just so I could show you... Nasty stuff it is. Of course the standard warning: Only harvest from places that you know are unpolluted and ensure you are harvesting the plant you intend. 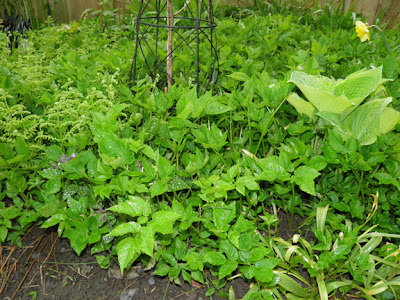 You can use ground-elder very much like spinach, kale or swiss chard (all of which are classified as “pot herbs”). I have used it as a seasoning in turkey burger patties and as a green topping in lieu of lettuce on burgers as well, with some tomato ad mayonnaise. It probably wouldn’t be too bad in a smoothie with pear and yogurt. Or as a salad with dandelion greens and some balsamic vinaigrette... I also bet it would make one heck of a saag if you ran out of "lambs quarters." 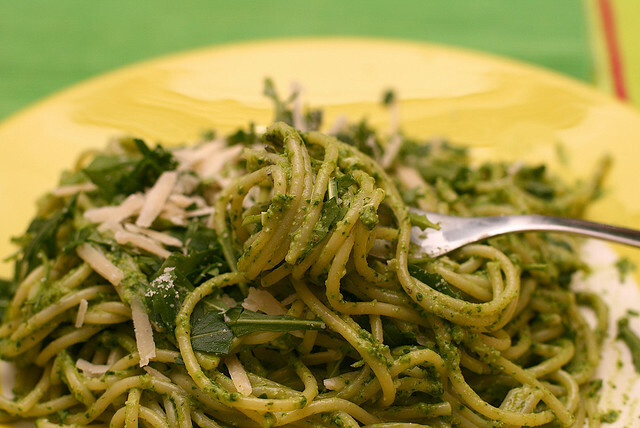 Place all ingredients except for the olive oil in a food processor. Pulse a few times to chop up. Add the olive oil in a thin stream until a paste forms. It may or may not take the full amount. Stir into warm pasta with garlic sautéed shrimp, or just alone with pepper and parmesan on top. It can also be used as a delicious spread for pitas. Other recipes will follow I’m sure. I have an “over abundance” of the stuff in my back garden. Note: leftover pesto can be frozen in an ice cube tray and then a cube or two added to stews or soups for a burst of flavour.